ADDIS ABABA, Ethiopia — An opposition figure who recently returned from exile was named Ethiopia’s election chief on Thursday as the country prepares for what the reformist prime minister vows will be “free and fair” elections in 2020. Birtukan Mideksa, a former judge, is the most senior ex-opposition figure to assume a high government post in Ethiopia in recent history. 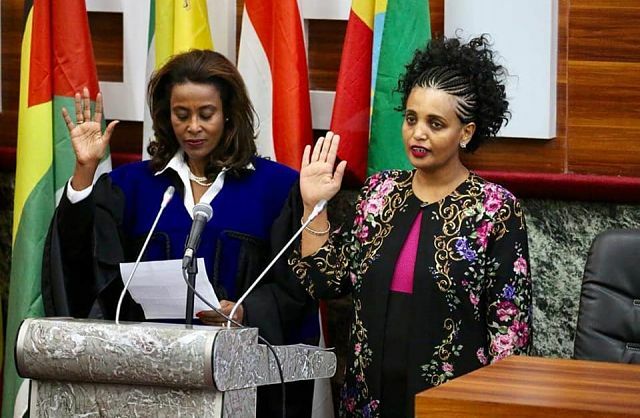 She is also the latest of several women appointed to high-profile posts in Prime Minister Abiy Ahmed’s new administration. Birtukan is among the Ethiopians who have returned to the country after years in exile, encouraged by the dramatic political reforms announced by Abiy since he took office in April. She was chosen by Abiy to lead the election board after the two met during his recent visit to the United States, where in a series of enthusiastic meetings he encouraged people frustrated by previous administrations to come home. Lawmakers approved the pick on Thursday. Birtukan left Ethiopia after years of friction with the previous administration. She was detained shortly after the violent and controversial 2005 election that led to the deaths of several dozen people. Opposition leaders were jailed after they accused the administration of Meles Zenawi of rigging the vote. She served an 18-month prison term before being pardoned in 2007 but was re-arrested in 2008 and sentenced to life in prison after officials accused her of violating the terms of her pardon. She left the country after being released again in 2010 and returned this month. Also on Thursday, the prime minister in remarks to lawmakers said the country would need to build a new town to hold all suspected of corruption and rights abuses in previous administrations. Sixty-three intelligence officials, military personnel and businesspeople were arrested this month over allegations of abuses and corruption.